When I first moved into my house, I instantly had a love-hate relationship with my kitchen. I loved it’s size and potential but I hated the style. 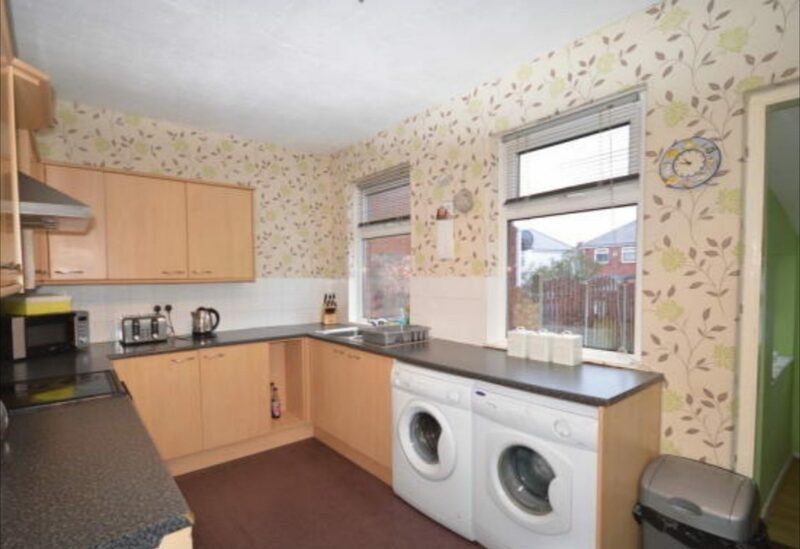 From the mdf cupboards and the flowery wallpaper to purple vinyl flooring and the lack of space for a fridge, looking at the kitchen didn’t fill me with joy. Before even moving in, I knew I wanted to renovate the kitchen. I had all these grand ideas about how I could extend it; have an amazing open kitchen, dining & living space. I could turn the small dining room into a utility and add tons of value to the house. I lost all of my ‘before’ photos due to my phone breaking. But this photo taken by the previous owners shows the old kitchen in all it’s glory. Alas, my budget wouldn’t allow it. So, I opted for plan B. To transform my kitchen on a small budget. So, that’s what I did. 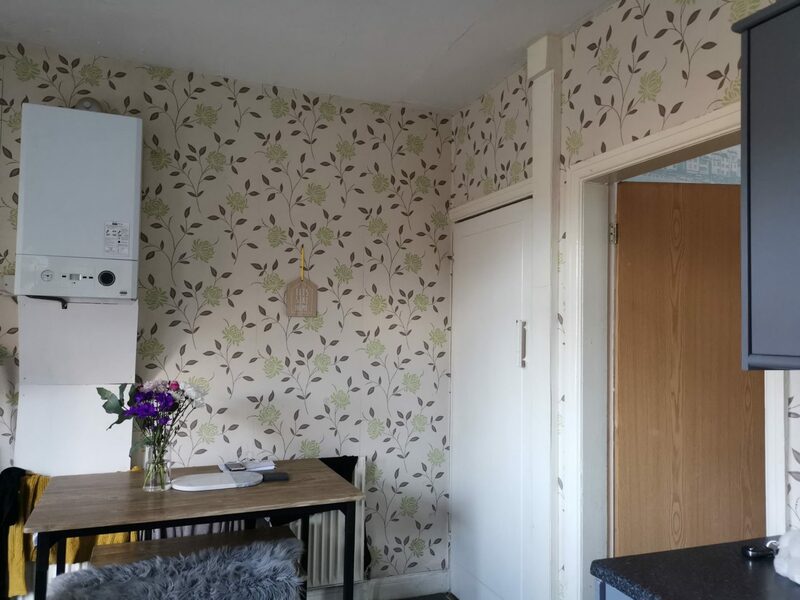 I renovated my kitchen for less than £250 and turned it into a room that I love. There’s still some more work to be done but it’s at a stage where I can happily cook in it without feeling like I want to take a sledgehammer to the kitchen units and rebuild it from scratch. When buying and renovating a house, money can be tight. It’s a long and slow process that requires a lot of patience. When I moved into my house 2 years ago, I ripped up the awful purple swirl-patterned lino that covered the kitchen floor. Doing so, meant I then lived with naked floorboards throughout the front room and kitchen for the next 16-months or so. It wasn’t my wisest move but it definitely made me appreciate my kitchen renovation even more. When renovating your kitchen it’s important to take into consideration what you want to do and your budget. Then, it’s time to be brutally honest with yourself as you figure out what you can realistically achieve with your budget. You may have to reset some expectations and settle for less than you initially set out to achieve. As a result, when looking to renovate my kitchen my first thoughts were to rip out the units entirely, refit the kitchen to make space for the fridge and get the boiler moved. Then my plans escalated and thought “well, if I’m doing that, I may as well get the washing machine moved into the utility room that was never plumbed” which then transpired into “…if I’m planning to plumb the utility room, I may as well knock down some walls and extend the kitchen instead”. So, you can see how easily plans for a small £200 renovation can turn into a £20,000 dream renovation. Knowing that I couldn’t afford the £20,000 (minimum) kitchen renovation that I wanted, it was time to go back to the drawing board. 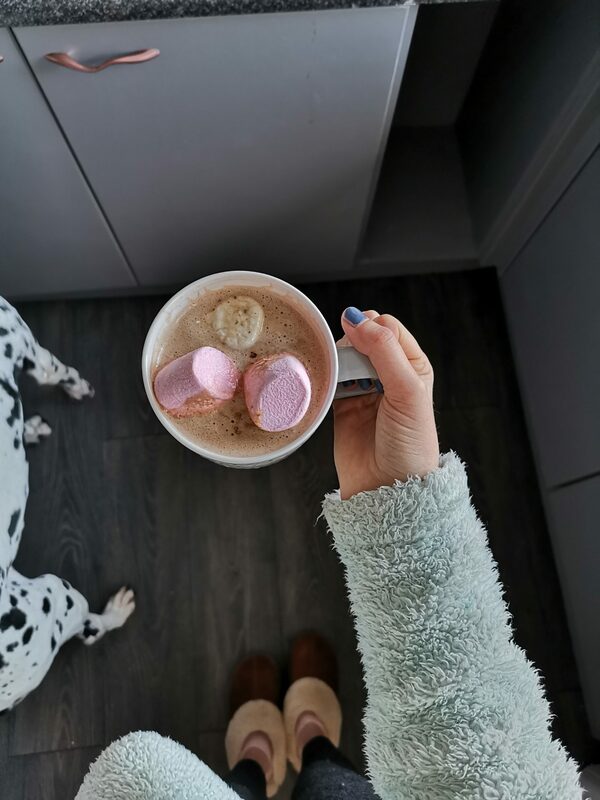 It was time to reset my expectations and think about what I could do to improve the look and feel of the kitchen without spending thousands of pounds that I don’t have. Funnily enough, my kitchen renovation didn’t include making any changes to the two things that frustrate me most and yet, when I walk into my kitchen those things don’t frustrate me anymore. Once you have planned what you would like to do to renovate your kitchen, think about alternatives that could be done for cheaper. 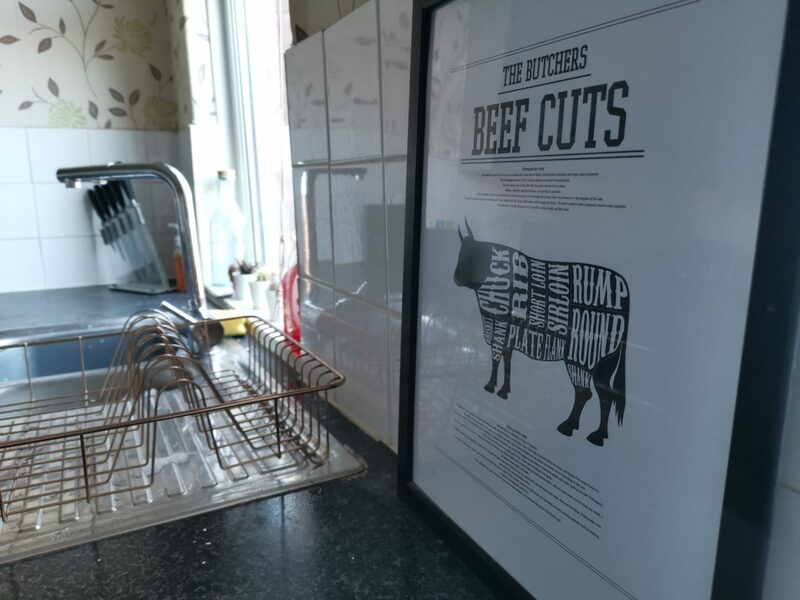 Knowing that I couldn’t afford to rip the old kitchen out and re-fit a new kitchen, I knew I had to re-think how I could turn my kitchen into a room that I love. 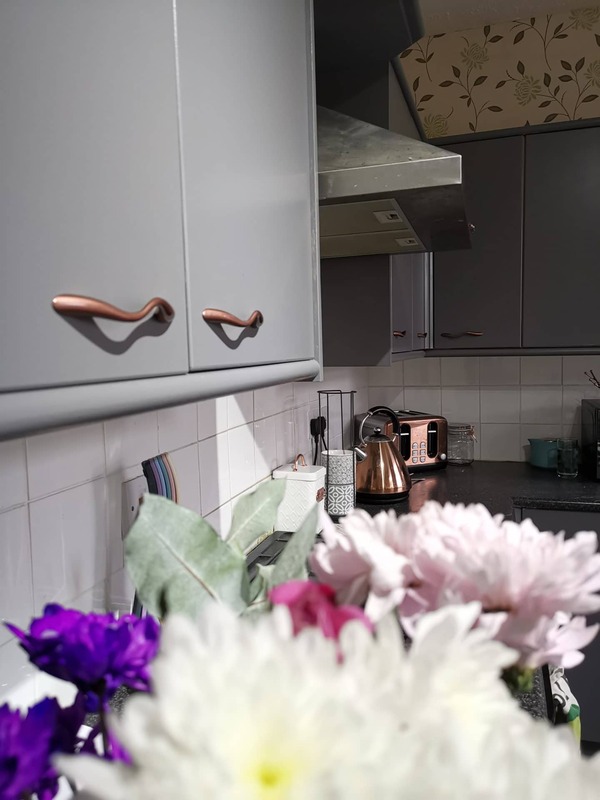 I knew I wanted a grey kitchen with rose gold accents to complement the grey tones of my front room and the rose gold kitchen appliances. As a result of this, I decided the easiest and cheapest way to transform my kitchen would be to paint the cupboards, replace the handles and (finally) lay new flooring. By doing as much as we could ourselves, we also managed to save some extra money than if we outsourced to a workman. The key to renovating your house on a budget is being willing to get your hands dirty. You’ll have to get stuck into DIY and be open to upcycling furniture to give it a new lease of life or buying second-hand. After reading streams of reviews saying that painting MDF is tricky, I was concerned that painting my kitchen cupboards would go terribly wrong. Thankfully, it was actually relatively easy and after a weekend’s work, I had lovely new kitchen cupboards. Before painting MDF cupboards, it’s important to sand and prime them. This will help the paint hold onto the surface of the cupboard and equally prevent it from soaking into the MDF, which is quite a porous material. To save on time, I didn’t bother removing the cupboards doors to paint them. It didn’t seem necessary to remove the doors and paint every inch of them. However, if you do want to do a thorough job, then go ahead and paint til your heart’s content. 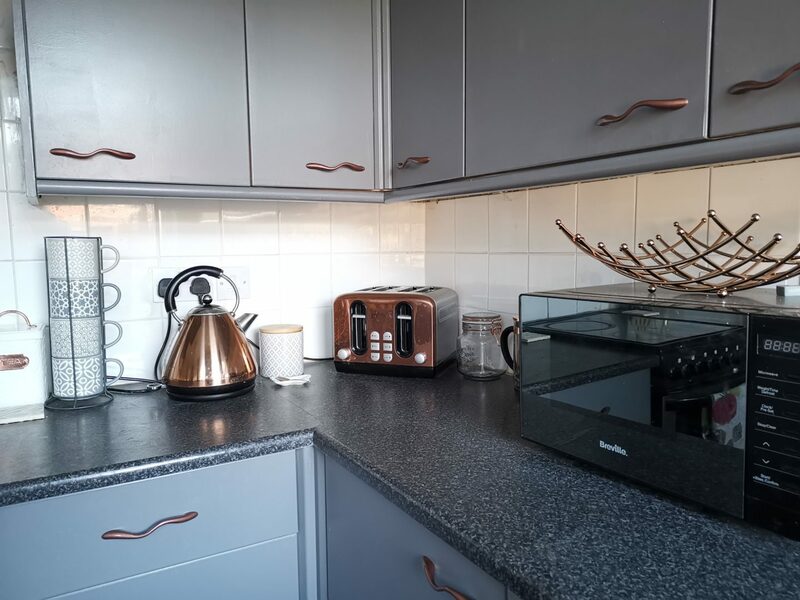 Instead of removing the doors, we just cleared the worktops, removed the cupboard handles and placed masking tape around anything that we wanted to keep paint free, such as the extractor fan. Then, it was time to set to work sanding the cupboards. Using medium grit sandpaper, lightly buffer the kitchen cupboards to remove the top layer and add texture to the cupboards. We just did this by hand but if you want to get the job done quicker, you may want to use an electric sander. Don’t forget goggles and masks! 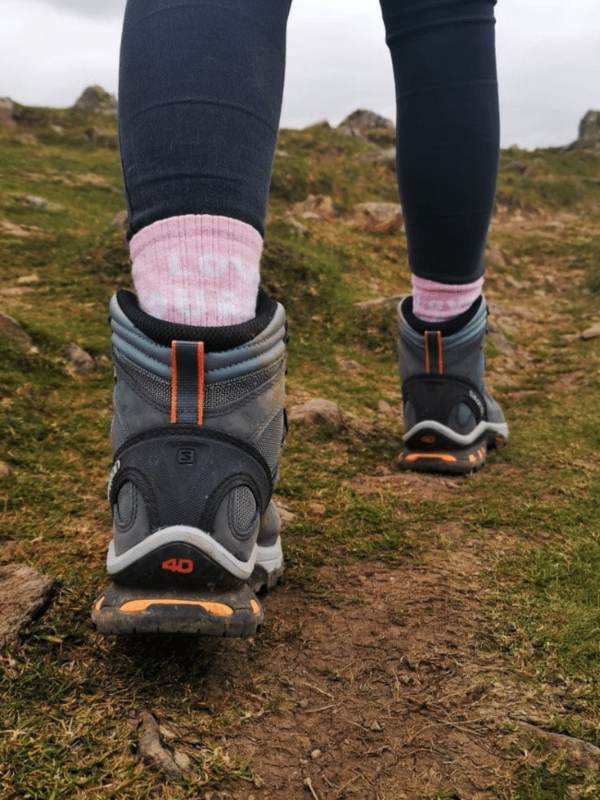 MDF can be pretty nasty to inhale (or get in your eyes) and all that dust could leave you with cold-like symptoms, so keep it’s easiest to avoid risk and just invest in a mask and goggles. You can pick these up for less than £5 in any DIY store. Altogether, sandpaper, a dust mask and goggles will probably cost approximately £7.50. Once the cupboards were sanded, we gave them a quick wipe to make sure they were free from excess dust then set to work with the primer. I found using a small foam paint roller was best for applying the primer. It ensures you get a nice even coat free from brush strokes or stipple. Though, a small good quality brush is needed for any edges or tricky corners. We used the Dulux primer for difficult surfaces which set us back £20. Since the cupboards were MDF I didn’t want to chance it with any other kind of primer just in case the end result was affected. Once the cupboards were all primed, we left it to dry overnight before it was time to paint they grey and see the real transformation. It looked a million times better already so I couldn’t wait to see the final result. Thankfully, the cupboards are durable and protected against the constant tea/coffee spills. The moody grey hues are my favourite! The next day we used the same materials of a small foam roller and paint brush to apply the grey cupboard paint. 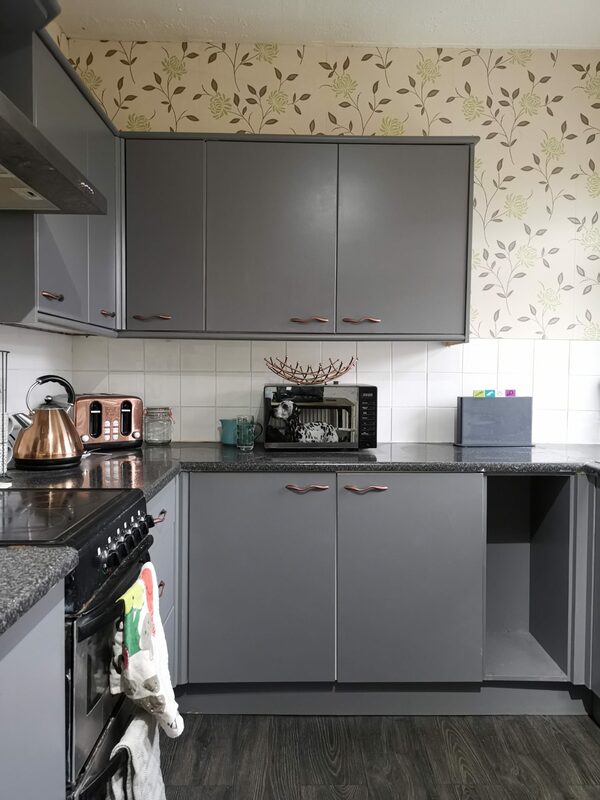 The paint used was Ronseal cupboard paint in granite grey which cost £17.50 for a 750ml tin. After a couple of hours painting (and only applying one coat!) all that was left to do was let the cupboards dry, clean up and re-attach the handles. Admittedly, I didn’t actually re-attach the handles for about 3 weeks… but it was worth the wait. Whilst it may have taken me 3 weeks to attach the handles but as I said, it was soooo worth the wait. Before re-attaching the handles, I spray-painted them copper to match the other small appliances in the kitchen. 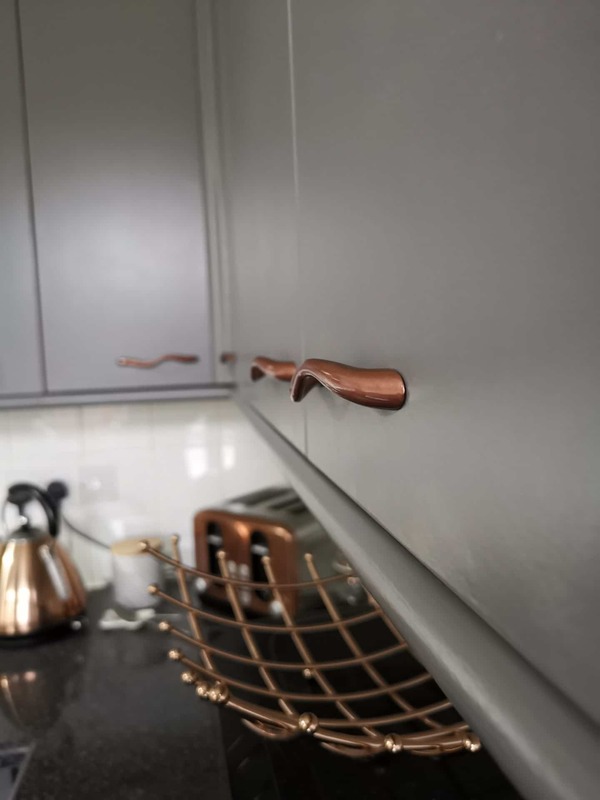 To spray paint the cupboard handles, I used copper Plastikote spray paint and a gloss top coat. Both of which came to less than £15. I actually had a gift card for The Range which meant I technically didn’t have to pay anything for the spray paint! Gift cards left over from Christmas also covered the cost of the primer used on the cupboards, sand paper and paint rollers. Before starting to re-spray the handles, I washed them in soapy water to make sure they were squeaky clean and free from any sticky finger prints. Then it was time to get messy! We spray painted the handles, making sure we applied a thin coat, then carefully placed them outside to dry. Once dried, I applied a second (and occasionally a third) coat before letting them dry and finally applying the gloss coat to seal the spray paint. When the top coat had dried, I simply screwed the handles back on the cupboard doors, stepped back and admired my shiny new kitchen! I did have a couple of little mishaps with spray painting which were mainly due to my own stupidity… Moral of the story? Don’t leave them outside in the rain when they’re still wet or you’ll end up having to start your spray-painting job from scratch all over again! Okay, I really can’t take any credit for this step other than choosing and buying the flooring and underlay. The credit for the actual hard work of laying the floor goes to Callum and his Step Dad who I couldn’t be more grateful for. After ordering many-a-samples and umming and ahhing over lots of varying shades of grey, I eventually decided on the Lodge laminate flooring from Direct Wood Flooring in the shade Charcoal Oak. This laminate flooring had a beautiful wood grain effect and at 8mm thickness and with some water resistant technology, I had confidence that it would be a long-lasting, high quality flooring. Obviously, having people to help fit the floor for just the cost of some beers and food can save you a pretty penny so I am really lucky in that sense. 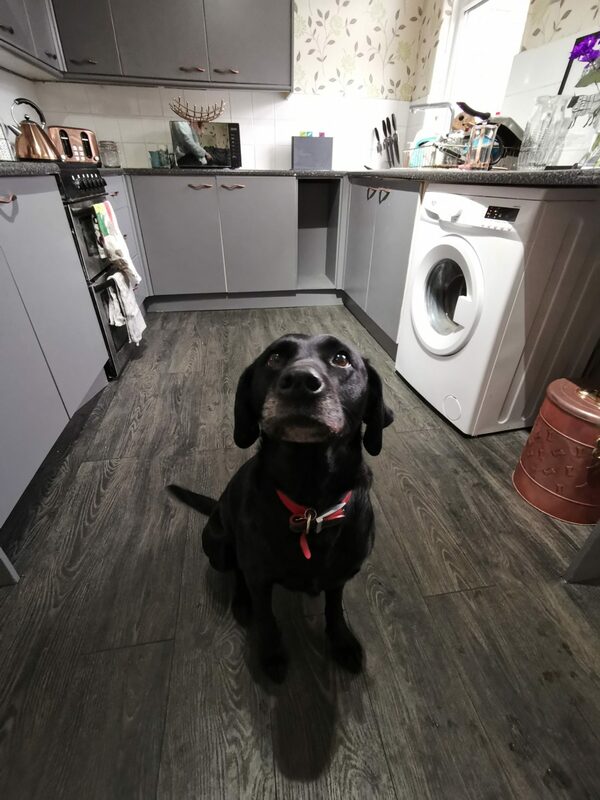 If you can’t fit the flooring yourself then I’d definitely suggest you shop around and ask local traders for a quote before going with someone so you can make sure you get the best deal. 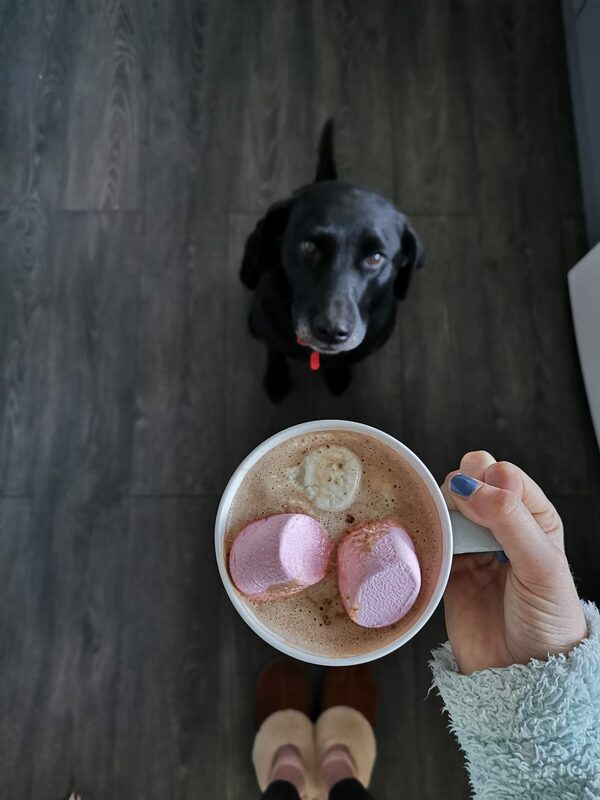 I wanted my flooring to run seamlessy from the front room into the kitchen so I bought enough to cover both areas and used 5mm thick underlay to help offer insulation, improve cushioning and minimise any subfloor imperfections. The flooring and underlay used in the kitchen cost approx. £150 and I’m over the moon with the quality of it. On the night of laying the floor, the kitchen tap burst and I don’t think I have ever felt panic like I did on that night! There was no way I was letting my freshly laid laminate flooring be ruined by a burst tap. After an hour of panic and finally managing the turn the tap off, the flooring was saved. Luckily, I had a spare tap (as you do…) that I had randomly picked up in Aldi at least 6 months ago. So, thanks to a burst tap drama, we ended up replacing the old and boring tap with the new, modern one! Altogether, the kitchen renovation cost less than £250 and I couldn’t be happier. Granted, I still want to change the wallpaper but right now, it’s something I can look past. The new grey cupboards and flooring detract my attention from the flowery wallpaper and have turned the kitchen into one of my favourite rooms in the house! Wow, you did a great job! I LOVE the rose gold accents 😍 And for under £250 INCREDIBLE, looks a lot more expensive. I’m going to bookmark this post for when I get my own place, so inspiring! Wow you’ve done an amazing job! The cupboards look great. We started renovating our kitchen at the start of the year and we’re on a very small budget I’d never thought of doing this with the cupboards though but I’m definitely going to look into it because I feel it’d make such a difference on top of what we’ve already done!